A lot of self-coached athletes I see struggle with the basics of blending swim, bike, run in a week. There are some who will underestimate the training, while others will over complicate things. I thought it would be helpful to create a basic template with some information that will assist you to customize a program that best fits in with you, your goals and your lifestyle. Please keep in mind that this is a basic way to create a program with the goal of making everything as simple as possible. Do not be concerned with getting caught up with all the needless effort of writing down how long you work, how long you need to sleep, time spent with family, time preparing meals etc. This is all unnecessary. Simply write down Monday through to Sunday and write down for each day the times you can train. You know your schedule and what you can fit in to each day throughout the week, so there is no need to complicate this. Knowing what time you have free to train is the first step. • Poor Fitness and new to Ironman: You need to spend a considerable amount of time putting in aerobic miles, both on the bike and run. You would want to start this training a minimum of six months prior to an Ironman, however sooner would be more beneficial. • Mid pack athlete: Ideally you need to start six months out with a combination of speed, strength and endurance and really start to dial things in from 16 weeks out of your Ironman. • Quarter pack athlete: You should mostly be working on speed and strength work from six months and start to add more endurance work come 12 weeks out whilst really dialing everything in. • Pointy end: Extremely customized program – this blog would not apply to you. In the 16 to 12 weeks in from your Ironman when you really start to build towards your race, you really need the following things in your program. There are a couple of reasons why I like to allocate the long ride Saturday, the long run Sunday and the long swim Monday. 1. Most people work Monday to Friday and have weekends off. A long run the day after a long ride helps create that feeling you will experience in an Ironman marathon. 2. If you put in your long run early Sunday morning, you have the option to spend the rest of that day with family to help create a good work/family/train balance. 3. I really like the long swim on a Monday as this can be a good recovery day for your legs. What is the reason you need a brick within your program? Your history will normally provide you with this answer. I have listed a few reasons and answers below. • I run well off the bike with little brick sessions in my program: You might be able to get away with just adding a run off the bike as part of your cool down. 10-20 min of easy running will do well. This can be good to add off a hard and fast bike ride. • I struggle from around 20-30 minutes into the run: This could be a pacing problem or you don’t do enough brick sessions or you might be doing the wrong type of brick sessions most suited for you. Make your brick sessions off a hard 90 minute ride. The brick should be around 30 minutes and done at race pace, (keeping a close eye on pace). One big problem triathletes suffer from within an Ironman, is that first 20-30 minutes into the run is way too fast for them. You need to keep this controlled. • I struggle holding pace off the bike: Running off the bike at race pace, include a 20 seconds walk between each 1km of running. Focus on holding the same pace throughout. 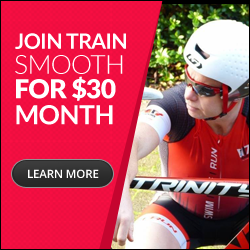 • I don’t have time for brick sessions as I have only an hour in the afternoon to train: Do a 40-45 minute indoor ride that is crazy hard and fast and include a 15-20 minute brick run. • I start to break down after an hour or two: You many need to increase the distance of your brick sessions and/or the distance of your weekly long runs. Another good possibility is to include an hour on the bike before your long run. At first make this ride all easy and over time slowly build it into a strength session and complete your long run off this. Another option is to have a few hours rest after your long ride then do an hour run in the afternoon, with the majority of this at race effort, (this should be done at effort and not pace). Between the afternoon run and the long run the next day, this should help. While there are many other reasons you may fall under, this will give you an idea. Please note that all transitions should be completed FAST. Even if the run off the bike is easy, transition should be as fast as possible. In an ideal world you will cover a minimum of three swims, three rides, three runs and three core/strength sessions. Some of these sessions you can make two within one like bike/run sessions or swim/run sessions. You really don’t want to make all sessions at the same effort/speed. Swim: After your weekly long swim, include sessions that are focusing on speed and power within the water. Bike: You have your weekly long ride, now it is time to add something shorter that is fast. Your indoor trainer is best for this session and also a ride with longer intervals that will help increase your race pace like 10-20 minute efforts. Run: If you have no injuries and can run safely, a weekly long run and a brick run as well as something a little harder and faster. Core/Strength: These can be done as little as ten minute sessions and can be completed at home. If you are in the gym, between once to twice a week can be enough as long as you are still completing some extra core strength sessions at home. Yes I know there is a lot more we can add and include but remember that I am just covering the basics of an Ironman program and want to keep things simple. Strength: Whatever you can handle that will not take anything away from any other sessions. Most of us have a weakness that we need to focus more on. For a lot of age groupers it is the swim, some the bike and others it is the run. Finding time to add an extra session per week that will help improve on your weakness can be hard as something has to give. Here are a few tips to look for. • Find the reason why you have this weakness. If it is the bike, ask yourself why. Could you be doing all your rides at the same effort or are you not doing enough miles? Once you have the reason, you can then look at ways to work on the reason. You may just need more speed work and strength work sessions. • Often removing a session like yoga or a gym session is the number one choice as you can get your strength session in through the swim, bike or run by using swim paddles, over gearing and hill repeats. This opens up some extra time within your program to focus on your weakness. • Including the weakness as part of another session, eg if your weakness is your swim, you can finish your long run at the pool and jump in for a recovery swim session. This will help with recovery and give you some extra miles in the water. These templates can show you how to include extra sessions to help with your weakness. Please note that with the running, if following this template, you will have two key run sessions and the rest will be more aerobic sessions. Aerobic: Keeping heart rate under 80% or in other words, you should be able to talk and train at the same time. If you can’t hold a conversation you are going too fast. Speed: Short fast sets with lots of recovery between each set. Strength: Swimming with pool paddles, over gearing on the bike and cycling or running hills. Easy: Very easy unless your legs are feeling okay and you are doing an easy ride then put the bike in the biggest gear and ride as easy as you like. If you struggle to get everything you would like to do within a week, maybe a ten day program could be the best option. You may note that I haven’t got any rest days posted. For most athletes I like to fill their program up and let their body and life circumstances dictate when to take a rest day. Often simply cutting the intensity out of a session but still keeping the volume maybe all you will need. Never change a session until you have completed the warm up first as some of the best sessions you may ever have will come off not feeling motivated to do it. If you are one of the following, please set in appropriate rest days. You are fully dedicated and never miss a session. Please feel free to email me tim@trainsmooth.com if you have any questions. I know there will be athletes who don’t fall in with what I have written so if you need some guidance, please let me know.